Purchase "Monk Punk and Shadow of the Unknown Omnibus"
I was pleased that my stories "The Key to Happiness" and "The Laramie Tunnel" were both included in this omnibus edition. 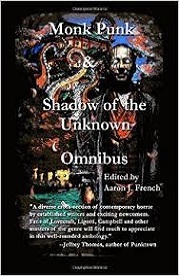 Author and editor Aaron J. French combines his first two anthologies, Monk Punk and The Shadow of the Unknown, together for the first time in this Omnibus Edition. In the tradition of Steampunk, Cyberpunk, and Splatterpunk comes this new sub-strain of speculative fiction--Monk Punk. Twenty-three hard-hitting Monkpunk tales of fantasy, science fiction, and Lovecraftian horror. Madness and the Mythos, the Surreal and the Sinister. The Shadow of the Unknown collects Twenty-nine tales of horror inspired by H.P Lovecraft and the element of the unknown in supernatural fiction. Think your sanity can withstand the assault?